I'm almost finished reading this book by Suzanne Somers. Its an interesting read that definitely warrants additional research. 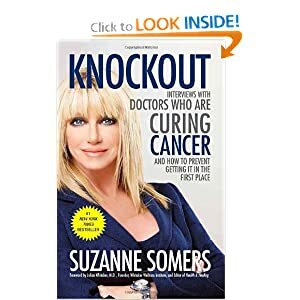 In this book Suzanne Somers interviews 6 doctors that she believes (presents her and the doctors evidence) are curing cancer without chemo or with very reduced amounts of chemo. I feel very saddened because I feel lied to either way. Either Suzanne and the doctors she is interviewing are lying or traditional cancer treatment in the US is a lie. Either way, it doesn't feel particularly good. Perhaps the doctors in the book are on the cutting edge of the new frontier, there was a time when we used leeches to remove infection. Perhaps medicine is just catching up to new treatments. Perhaps the medical machine is just too huge to change due to funding issues. I'm glad that I am reading this book at a time when I don't have cancer in my life or the life of a family member. It gives me the time to do the research myself. Maybe my Public Health thesis will work on validating or disproving what is expressed in this book, scientifically. If you get a chance to read it, let me know what you think? If you have personal experience with any of these doctors, let me know of your experience. Happy Reading!